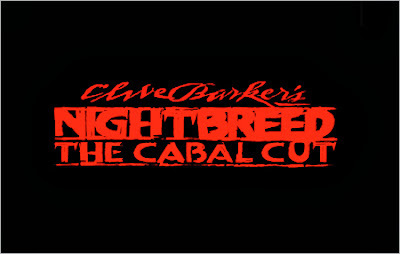 Nightbreed is the story of Boone (Craig Sheffer), a young man in love with a nice young girl. He had troubling dreams so he had gone to see a shrink named Decker (David Cronenberg). Decker is actually a nut job serial killer who hopes to pin his crimes on Boone and use him to find Midian, the place where monsters live. Decker's plans send Boone to the mythical city and set in motion a battle between humans and monsters. The version screened Saturday night as part of Scary Movies was the now legendary Cabal Cut, which is an attempt to get the film back to what director Clive Barker intended. We were told that this version is the seventh version of the Cabal Cut. The film runs 45 minutes longer than the theatrical cut but actually has an hour of new material since the studio mandated footage was all removed. Its a version that puts in every bit of footage they have (its a mix of VHS and DVD) that fits in context. Its a version that will be trimmed for the eventual Blu-ray and DVD releases. Seeing the film closer to what Barker intended it's clear that the film is less horror film than adventure fantasy. This is the story of how Boone comes into his own as both destroyer and savior of the Nightbreed. It's been too long since I've seen the original version of the film to say if it's better, though I will say it's different and very good on it's own terms. I've always liked the film a great deal and seeing it this way was a real kick. I'm not sure that they are going to make a lot of new fans with it, but they just might. I say this because in this day of HD perfection the rough video edges are going to annoy many who don't know or don't remember VHS decay. Many younger film fans who won't watch black and white films will balk at this. On the other hand if you are a fan with a great love of the film or even just some one with a like of the film and you get a chance to see the film this way do so because it adds so much.